Does anyone know if the spindle thru-holes (ID taper aside, of course) had anything done to them beyond drilling? Were they bored or honed to any size or straightness? Steve at Monarch thinks they were gun-drilled but wasn't sure of anything else so I thought I'd ask here. I'd like to know if the spindle's ID could be used as a locating feature. Don't know but would guess the through hole would be stated size+ .but would/may not be dead true bore at center line to bearing fit. Don't know of anyone doing so but one might be able to bore the ID behind the taper fit for a reasonable distance..Perhaps could run a staring bore and then run a reamer or gun drill through.. What are you thinking to do? Still manufacturing a lathe tube it would be good practice to start with a centered shaft so it would/may be be close. Good question so do indicate yours and let us know what you find. Last edited by michiganbuck; 12-07-2018 at 10:40 AM. I would trust the spindle centerline only at the taper, the rest could be anywhere. It is smooth enough that you can use an Aloris S-2 spindle stop reliably, if that helps in what's you're doing (and a spindle mounted stop lets a 5C Sjogren perform as a dead stop chuck). If you dont have a bar long enough to all the way through, a shorter bar inserted into the bore at the chuck end with a runout check and again at the back end with runout check should tell you as well. I tested the minor bore, the point between the jarno taper and the left end of the spindle where collet attachments are mounted on two EE models. Early 50s machine, the bore was finished by single point boring to an ID of 1.403" fairly good finish no detectable run-out. mid 80s machine the bore was finished honed to an ID of 1.407", no detectable run-out. The reason I checked the bores out, was to fabricate a plug that will just slide through the spindle bore. 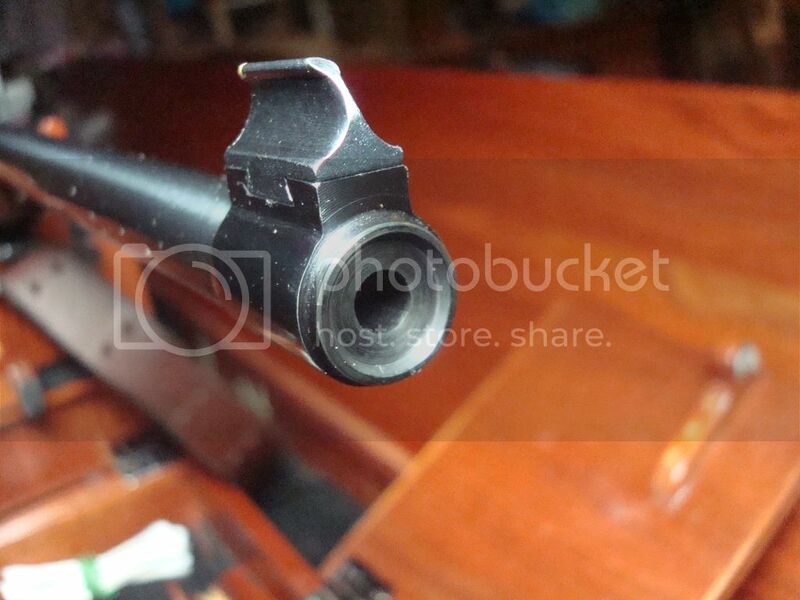 On the end of the plug is a pin that will fit into the chamber end of a rifle barrel, or the muzzle end. This tool will stabilize the rifle barrel inside the spindle.........as, the head stock on an EE is over 24" long! The above is a compromise to not being able to use a "spider" with a pin in the barrel bore, to dial in the left end of the barrel, such as on a short head stock lathe. Just something I have done related to this thread. That will not tell you anything about the concentricity of the spindle bore. Shorter bars wedged into either end is a worse idea. Donie, that's exactly what I wanted to know. If I wanted to crown a barrel, could I out the chamber in the spindle with a snug fitting collar and use the 4J to indicate the muzzle true? Given the distance between the muzzle and chamber, I think even a loose sliding fit 20" away from the working end would provide very little angular runout. What he already said as to "no detectable runout". I have a spare spindle sitting on its nose, and just tape-measured it at about 24 1/2" from a flat-plate across the empty D1-3 to same at the rear end. You can USE both of the nose taper AND that rear finished ID cone for your adapter, BTW. Where and how it mounts itself, and where it grips a barrel need not be the same and probably cannot easily be unless you prefer fishing it in and out with some sort of hook or pusher tube to actually using it. Add one small "extra safe" if worried, and you'll be golden. CHECK it for actual runout. IF imperfect? (It might not be..) Just fine-finish it in situ. Then always insert it CLEANED and to the same alignment mark. NB: This presumes a round barrel. Not all are, most especially for a pistolsmith! This is what I have done so far, first read up some on how gunsmiths deal with gun barrels, then found an approach that would work with the equipment at hand. If a 18" barrel is held in a four jaw chuck, so as the end protrudes 1" from the jaws for crowning or working the chamber end, the other end will be unsupported inside the spindle. Also, the OD of the barrel may not be concentric with the bore. So, I thought it would be more ideal to locate the bore using a pin in the end of the snug fitting plug I made, rather then using a bushing around the OD of the barrel to prevent the barrel whipping or bending inside the spindle. Here, keep in mind I am using an EE, When I can, I use high speeds for the finish along with accuracy. Now, with the machined plug inside the spindle, equipped with a pin to tightly fit the barrels bore, I push the barrel and plug back into the spindle, then using a four jaw chuck with lead pads on the jaws, true the barrels bore using another pin. A Note on the plug, I gave it less then .001" clearance to the spindle bore, then grooved it at each end for Orings, to help keep it from drifting within the spindle. Also, I made the plug so I can change the pin size for muzzle and chamber ends. I wanted to try out an 11 degree crown, but thought I would end up re-cutting it to 90, more typical with a 22lr, it worked out, so I left it there. They were just gun-drill in Monarch manual lathes. Monarch built their own gun drill using a Monarch 612 lathe with special drill holder in place of the normal carriage, and a special guide in front of the headstock. These spindles were forged to net shape and were solid to the best I can remember. The drilling was very accurate, but being a clearance hole, it was not finished. CNC lathe spindles were larger through holes and these were bored to size with a good finish.